Netflix has flipped the on switch for 4K streaming in a handful of videos, including the second season of House of Cards. 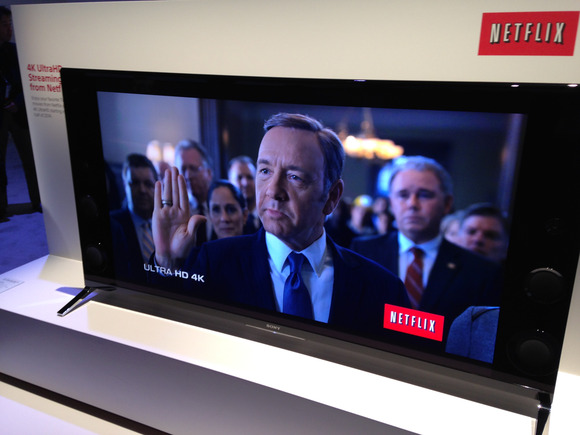 For Netflix subscribers, the 3840-by-2160 resolution streams are available on 4K televisions that support HEVC/H.265 decoding capabilities. This requirement may leave out early adopters who picked up a 4K TV last year, but 2014 models that are hitting the market now shouldn’t have problems. The only other hurdle for subscribers is on the bandwidth side. Netflix’s 4K videos stream at 15 Mbps, and the company requires at least a 20 Mbps connection for the high-resolution stream to come through. Even for users who have a fast enough service plan, 4K streaming could be a problem during peak hours. In addition, issues related to the handling of Netflix traffic as it flows to Internet service providers can result in slower speeds . ISPs say they are being overwhelmed by Netflix traffic, and feel they should be paid to add more capacity because transit providers aren’t taking enough traffic back in return. Netflix recently agreed to pay Comcast, the nation’s largest Internet service provider, for more direct access to Comcast’s network, thereby improving speeds for Comcast customers, but Netflix doesn’t seem happy with the arrangement. For Netflix users who are able to stream in 4K, the U.K. Website HDTVtest says to expect the clearest differences in bright, colorful scenes. “Every time the video stream switched from [1080p HD] to [2160 HD], it’s as if a veil had been lifted from the front of the screen,” the site wrote.